Fla.Vor.Ice foil packets have 4 sections. The first section has a lollipop and the 3 other sections have popping candy in 3 explosive and tasty flavors. The foil pack is nice and big providing great value for the retail customer. 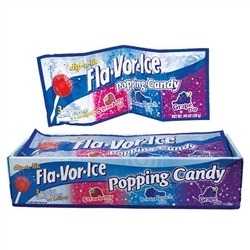 Each store counter display contains 12 Fla.Vor.Ice Popping candies.